Life insurance is an extremely important investment for anybody worried about the wellbeing of their loved ones after they pass away. If somebody close to you may suffer financially if you die, it’s important that you protect their future with a suitable life insurance policy. The idea of life insurance is not a new one – humans have been using some form of life insurance policy to protect their loved ones for thousands of years. Life insurance policies have evolved a great deal since their inception, starting as a luxury and evolving into a normal part of a financial portfolio for every Canadian. The original idea of having insurance policies has been traced back to nearly 5000 years ago. The Chinese used a sort of insurance plan as protection from pirates while at sea. Though these protections are now seen as being somewhat primitive, this revolutionary way of protecting assets saved Chinese merchants and traders great sums of money and cargo if their ships were attacked and pillaged by pirates. Another storied example of life insurance can be traced back to the Roman Empire, where a military leader, Caius Marius, began a “burial club” for his soldiers. The club ensured that in the event of an unexpected death, other members paid for funeral expenses to give the departed a proper burial. The concept eventually fell into obscurity with the fall of the Roman Empire, not returning to popularity for more than 1000 years. The first instance of life insurance as we currently know it came about in 17th century England, with the founding of Lloyd’s of London – then known as Lloyd’s Coffee House. Sea merchants and traders from all across the country came to Edward Lloyd’s coffee house to obtain marine insurance to protect their loved ones in the event that something tragic should occur at sea. The first American life insurance company was founded in 1759, based on a similar model to the one that Edward Lloyd popularized in England. In its earliest incarnations, American life insurance was mainly used to benefit poor and distressed Presbyterian widows and children. It wasn’t until 1840 that life insurance became truly popular with American citizens, following New York’s devastating Great Fire in 1935. After yet another tragedy in the form of the Great Chicago Fire in 1871, Americans started to take the idea of life insurance seriously. The idea of life insurance took quite a while longer to finally catch on in Canada. This came about in 1846, when Hamilton’s own Canada Life started regularly issuing insurance policies to Canadians and Englishmen abroad. The idea came to the company’s founder Hugh C. Baker after a trip to New York City where he sought to secure insurance. Once back in Canada, Baker helped to popularize life insurance policies in his native land. Life insurance has been popular in Canada for more than 100 years – the country now offers a wide variety of products, policies, and providers across all its provinces and territories. As of 2014, 22 million forward thinking Canadians hold some form of life insurance to ensure the future security of their families. The average Canadian life insurance policy ranges from more than $190,000 for individual holders, and over $380,000 for families. In 2014, nearly 700,000 policies were purchased, with an average individual policy of more than $300,000. 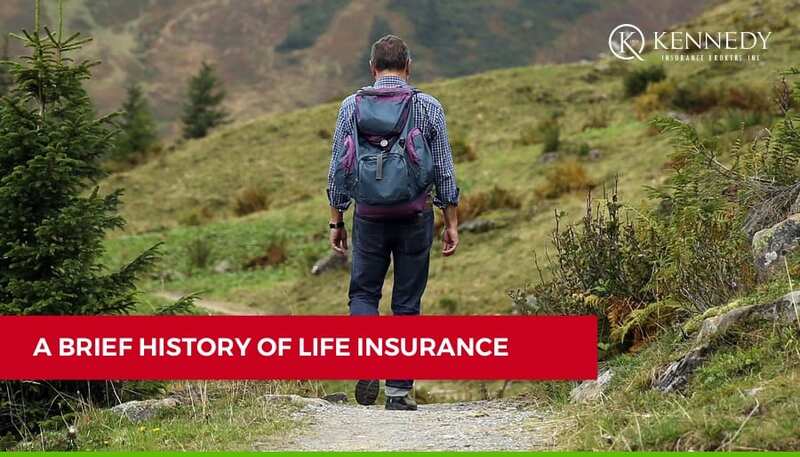 Though it took some years and a number of unfortunate tragedies to catch on, life insurance has been an important part of North American culture for more than 100 years. For those who are worried about the safety and security of their families after their death, life insurance provides a great deal of comfort and assurance. For that comfort, we can thank the great minds of China, Rome, and England. If you’re interested in purchasing a life insurance policy for your family’s security, contact Kennedy and speak with one of our knowledgeable brokers to help you find the best option for your life insurance.